DURHAM, NC, June 4, 2014 — The Council for Entrepreneurial Development (CED), the Southeast’s largest entrepreneurial support organization, has released its Innovators Report, showing that entrepreneurial companies in North Carolina collectively raised more than $461 million through equity investments, grants and awards in 2013. The report also finds that 108 unique funders – 75 percent of them from outside the state – made a total of 260 investments in North Carolina technology, life science, and advanced manufacturing companies during the calendar year. The full report can be found online at www.cednc.org/innovatorsreport. The 2013 Innovators Report details information on 134 life science deals, 106 technology deals, 19 advanced manufacturing deals, and one outside these industries. The report also lists mergers and acquisitions and key corporate partnerships. Investments in life science companies outpaced technology companies, both in total numbers of deals and in dollar amount. North Carolina accounted for the largest number of unique funders (26), followed by the Northeast (24), and mid-Atlantic (14). California, Midwest, and the Southeast (outside of North Carolina) each represented 10 unique funders. 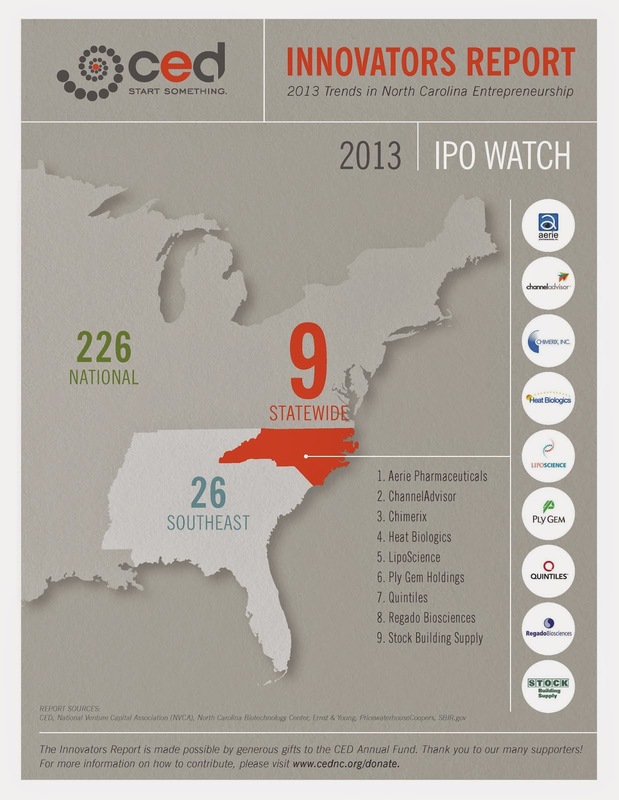 Ten international funders made investments in North Carolina companies. Crowdfunding contributed $225, 789 to technology companies. CED’s mission is to identify, enable and promote high-growth, high-impact companies and to accelerate an entrepreneurial culture within the Research Triangle area and throughout North Carolina.